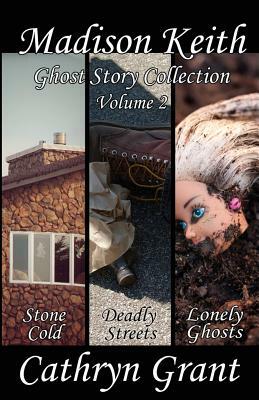 This collection includes novellas four through six in the Madison Keith Suburban Noir Ghost Story series: Stone Cold, Deadly Streets, Lonely Ghosts. In the fourth novella of this Suburban Noir Ghost Story series, Madison Keith visits her best friend on the Oregon coast. While staying in an unusual stone house, she meets two disturbing women who harbor a shocking secret. As Madison seeks to uncover the reasons for their cruel and aggressive behavior, she has a supernatural encounter, and stumbles across the body of someone who has been dead for some time. Escaping from the others for a few minutes of sanity, Madison talks to her boyfriend, JD, and makes a decision about their relationship. In the fifth novella in this series, Madison stumbles across the body of a homeless man lying in the street in front of the church where she works as an administrative assistant. The sickening and persistent ghost of the dead man forces her to search for an answer to why he was murdered. Madison's relationship with her boyfriend hits a rough spot when she reveals a dark part of her past and his reaction is not what she'd hoped for. In the sixth novella, Madison and her boyfriend, JD, go to Australia to visit his twin brother, Luke. Before the plane lands in Sydney, a woman's body is found in Luke's garden. Madison and JD seem to be more interested in coming up with potential suspects than Luke, and when the ghost of the dead woman appears in their bedroom, whispering that she's lonely, Madison knows she has to dig deeper before the ghost gets her icy fingers into JD. Both the living and the dead like to reveal their secrets to Madison. As the administrative assistant in the basement office of a suburban church, she gets plenty of opportunity to hear from both. Through it all, Madison continues to offer up a steady stream of opinions on everything from the subject of religion and ghosts to finding a soul mate.